COMPOST! We will be collecting food wastes for composting from all Campus Housing locations and adding those numbers to UofL's organics recycling totals! Look for a compost collection bin in your residence hall's common kitchen or trash room, and add your organic wastes to our totals! Please no animal/dairy products or liquids, but otherwise, if it came from a plant, we want to compost it: fruit & vegetable wastes/peels/rinds/seeds, bread, pasta, rice, tea bags, coffee grounds/filters, even paper products (tissues, towels, napkins, plates, cups, newspaper, etc.). 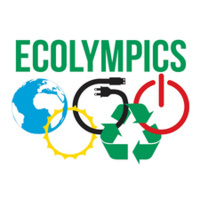 We will be offering a collection of electronic wastes for recycling at both the Kick-Off event and in every residence hall's lobby throughout Ecolympics 2019! You can recycle any electronic consumer items, including: all computers, monitors, televisions, printers, copiers, scanners, servers, networking equipment, fax machines, telephones and cellphones, RAM/memory, hard drives, battery backups, and peripherals such as keyboards, mice, speakers, AC adapters, and mixed computer cables/wires. Please make sure your data has been wiped from your device before recycling. We will also have collections for recycling any type of battery, lamps, and ink/toner cartridges. Live on campus? Win with conservation! UofL residence halls will compete among each other and battle together against campuses across the country to see who can reduce electricity use the most over three weeks. All you have to do is stop wasting energy! Turn off lights/TVs/computers; unplug anything you're not actively using; skip the elevator for the stairs; close windows tightly; dry clothes on a rack/line; take quick showers or shower with solar power at the SRC; etc. In addition to a Green Renovation prize for the winning hall, one resident who takes the most steps during Ecolympics 2019 will win a restored vintage Peugeot road bike , gift cards to Comfy Cow and Heine Bros. coffee, and other fabulous prizes!! Each week, those who post green actions will be entered to win fabulous prizes such as Comfy Cow and Heine Bros. gift cards. Post your sustainable actions and tag @UofLSustainable throughout February & March to be entered into the competition!